It was my birthday yesterday and like most birthdays I baked my own cake. 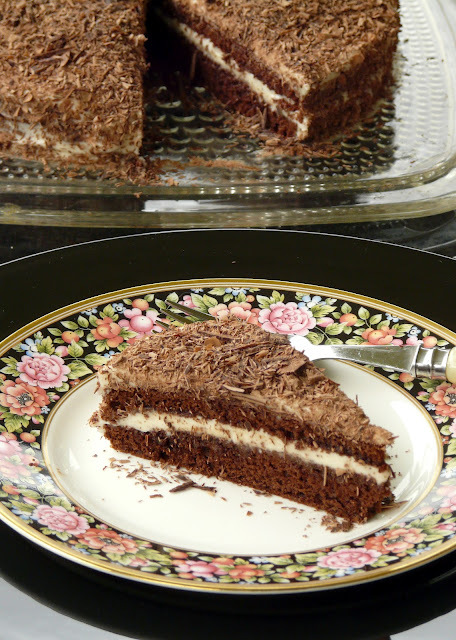 with a Mocha Mascarpone filling. 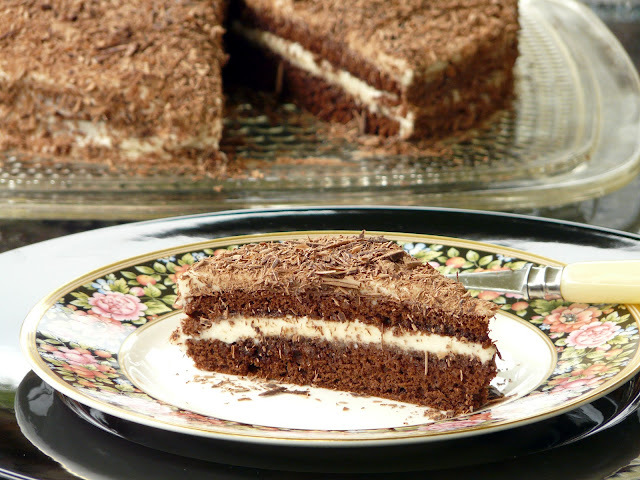 The recipe for the cake originates with Alice Medrich. another blog - Baking Obsession. I also made a couple of minor changes which I've noted in red. I adapted this recipe from Passionate About Baking. 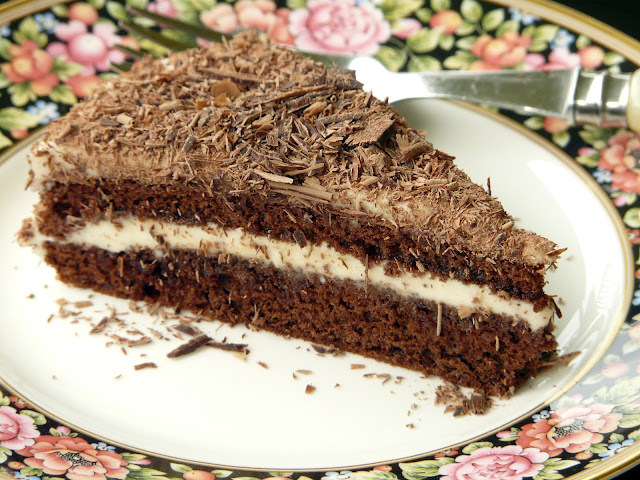 Her adapted cake version is from Baking Obsession and Baking Obsession adapted Alice Medrich's recipe for the Chocolate Genoise. Simmer water and sugar for a few minutes to make the syrup. Add coffee extract or espresso powder. Optional: I ground a few espresso beans into a very fine powder and added to the mascarpone mixture. You could also use coffee extract. Beat mascarpone with heavy cream (whipping cream) until smooth. Add vanilla (coffee if using) and add powdered sugar. Mix well. Should be thick enough to spread between layers and to ice the cake. Preheat the oven to 350F. Line, grease & flour an 8-inch round cake pan. Sift the flour and cocoa together three times; reserve. Bring some water to a boil in a large pan & reduce to simmer. to 2 days, or frozen for up to 3 months. Brush each layer with coffee syrup. Spread mascarpone filling over bottom layer. Add top layer and ice with remaining mascarpone. Sprinkle with shaved chocolate and refrigerate for a few hours before serving. Happy Belated Birthday! Like you, I love a great homemade birthday cake (even if it means if I bake myself). Looks delicious. I use dental floss too! I remember you always make your cake..
Love your reds..and it all looks DELICIOSO. I watched Anna Olson last night and she made quite a few chocolate cakes..that looked good..Now yours is added.. Thanks Monique. Next time I make this cake it will have a white chocolate ganache filling. Happy belated birthday, Ann. By the looks of that lovely cake, you must have had a fabulous birthday. I agree on making your own birthday cake. Ann and Moe, I can't tell you enough, I LOVE MY CUTTING BOARDS! Don't be surprised if I cave in and get another one. The more unique the wood, the more I love. Thanks Brenday. I'm so happy that you love your boards. You have one of my favourites.